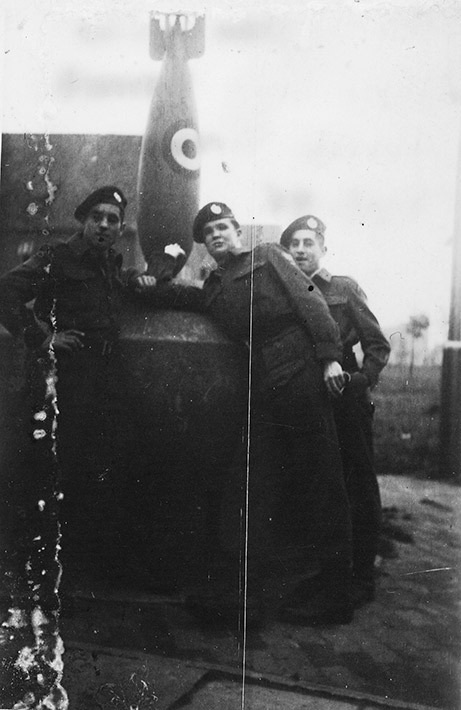 Photograph of soldiers, standing around bomb, positioned on top of large circular mount, Maple Leaf Barracks, Aurich, Germany, September 1945, from the collection of Rino Albanese. Aurich served as the base for Canadian War Crimes Department (North West Detachment). The Royal Winnipeg Rifles provided guard detail. At the age of 18, Rino Albanese and his twin Philip enlisted in active service with the Canadian military. They were trained at Petawawa, where most of the about 600 Italian Canadian internees were housed. At the same time, the twin's father, Giovanni was designated as an enemy alien. The brothers were sent overseas where they served with the Canadian forces in England, Holland, and Germany.